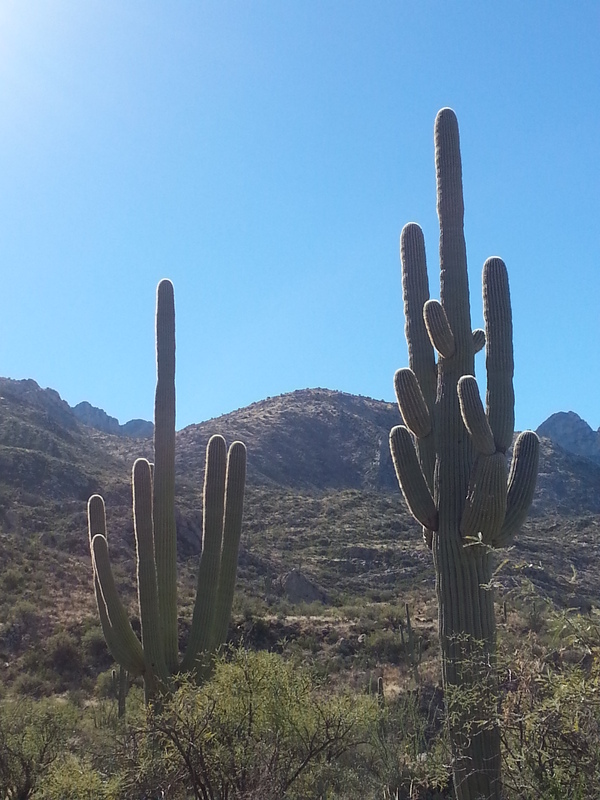 Felt like coming home to cross the border into Arizona from California. 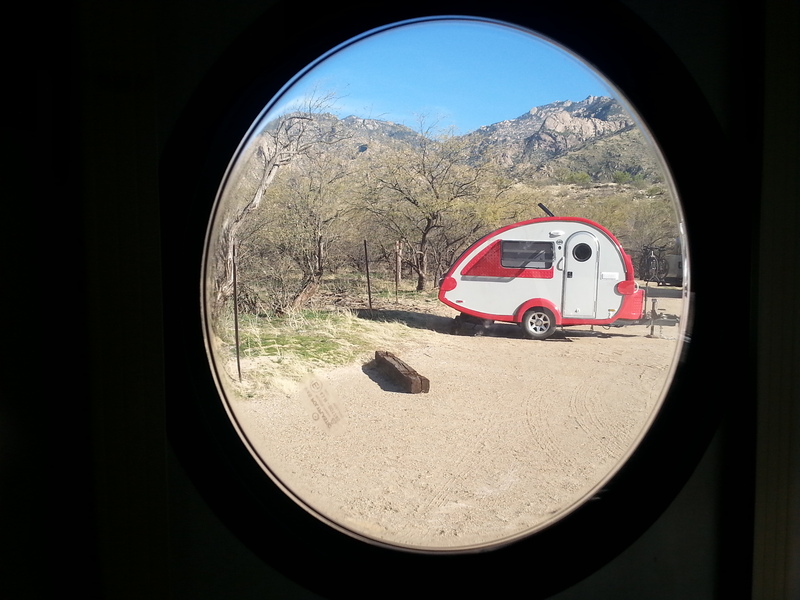 We were undecided about camping at Joshua Tree NP for a few days before heading on into the Tucson, but decided to make the marathon run and get all the way to Catalina State Park, and just stay put for four days. It was a great decision for us, although not without a few unexpected glitches. For our month on the road, we’ve had reservations everywhere, and have really not needed them at all. Nowhere was full, or even semi-full. So, the only place we pull into, not expecting problems was FULL. What? Oops – forgot about the Tucson Gem & Mineral Show, which starts this weekend, and runs for two weeks. This show attracts tens of thousands of vendors and buyers. How could we forget? 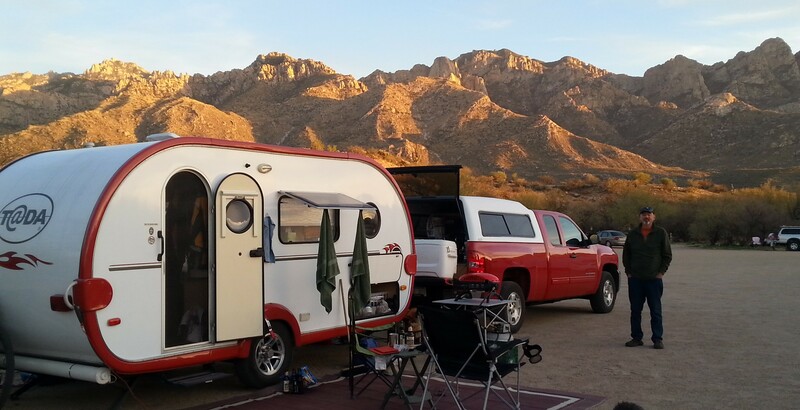 We were lucky to score a space in the overflow lot at Catalina State Park. Woke up on our second day there, looked out the porthole and saw this! After two nights in overflow (a big gravel parking lot with a huge, beautiful new bathroom/shower building), we were able to get a spot for two nights in the primitive camping area. No power or water, but bathrooms/showers, a tree, and our own picnic table. Heaven. Catalina SP is spectacular – clean and well-run. 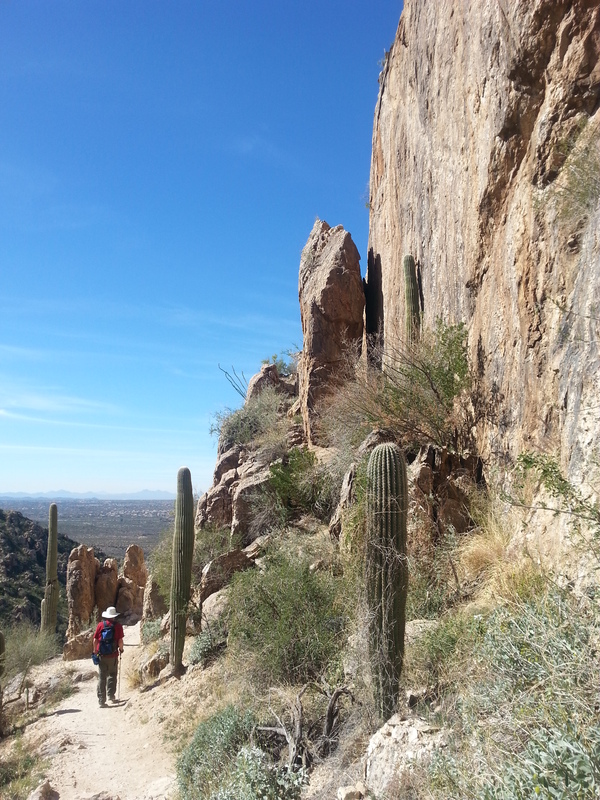 A little bonus – we were approached by volunteers to fill out an extensive survey about the State Park system. For our efforts, we were awarded passes for two free nights camping in the next year. Been a long time since we’ve made $50/hour! Tonight is our 8th consecutive night without electric or water service. We never really got our batteries fully charged up on the road, so power has been at a premium. We’ve shut off our fridge off for extended periods of time, and have had the solar collector out dawn til dusk every day. But, as I write this, the refrigerator is still running, and our phones are charged. (sort of, anyway). John is looking for systems to amp up our solar system, so we don’t have to worry about refrigeration. These are our last few hours before cleaning things out for a month, and storing the Fireball. We’re happy. Enjoyed two excellent hikes while we were here. It’s easy to forget how HOT it can get here at 80 degrees, when you’re in the mountains, and the sun is beating down. (I know my Michigan friends think I’m complaining, but I’m really not. 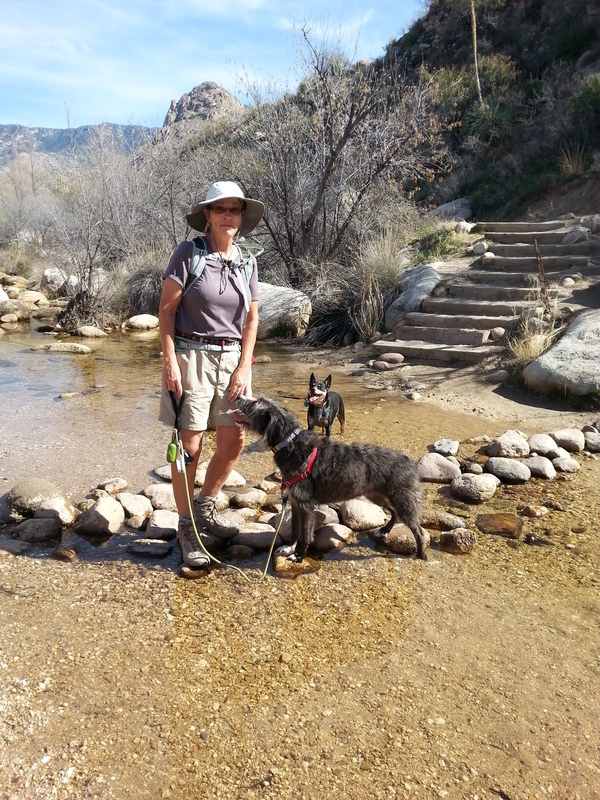 Lynn, Jezzy, and Rose cool their feet while hiking. Room to stretch out in our rental condo for the next four weeks. Ahhhhh. We’ll meet up with old friends, gather with both my sisters and their husbands for the month, and have the chance to really put in some cycling miles. We’ve both been surprised at how little time we’ve spent on our bikes so far – we know that we need to re-think our packing program to make bikes easier to unload and go for a quick ride. Four bikes take up alot of truck space. Vern and Ilene Baker, T@DA camping friends from the area joined us for dinner tonight. It was a blast to meet up with them again and trade camp secrets. We’re trying to figure out if schedules can be coordinated to allow us to camp together for a week or so in March. It sure would be fun if we can make that happen. Life is pretty darn good right now. 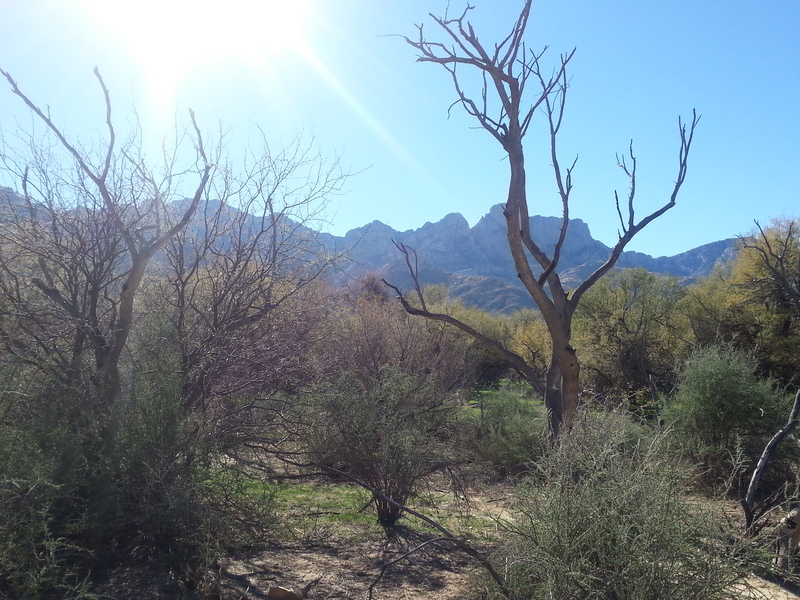 This entry was posted in Arizona, camping, great outdoors, hiking, simple camping, state parks, Texas and tagged Arizona, camping, hiking, simple camping, state parks, T@DA, the great outdoors by Judy Crankshaw. Bookmark the permalink. WE really enjoyed our three days at Catalina! Love a place that has so much hiking, biking and all the conveniences of the city just across the street. Great pictures! Enjoy that month in the condo! I look out the window and see almost three feet of snow on the ground, with more falling from a gloomy sky, and then I get to read one of your wonderful posts to remind me that this winter will end eventually. I feel bad knowing that my Michigan pals are still in the deep grasp of a really difficult winter. Jerry, you know that you see more on an afternoon in PalmeR Park than than I will see in six months out here…..that’s what keeps my guilt in check. I do appreciate the fact that you hang with my blog. Thanks. Judy, thanks for sharing your trip. I’ve really enjoyed reading about it. 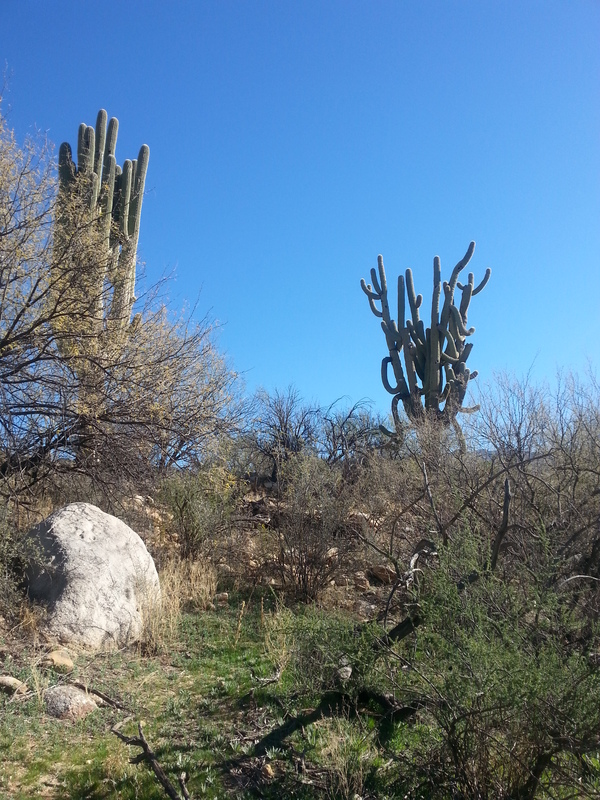 I’ve been jealous with most of the posts, but this one is just making me angry – looking at those pictures of beautiful, warm Arizona while today’s 5-7 inches of snow falls. ;-) please keep sharing. Great pictures as always! I see your friend has a blue healer. We have a red healer. I wish I had your kind of space for him to run around in!! Rose is my sister’s dog. She’s great. Crazy sometimes to watch her as she ‘studies’ a situation. I’m pretty sure she is smarter than I am. Don’t think I’ve ever an a red heeler. Same dog, just a different color? Living the life of Riley! Glad it’s going so well for you. Pics are gorgeous. Riley, who? We are living the life of the Campshaws. 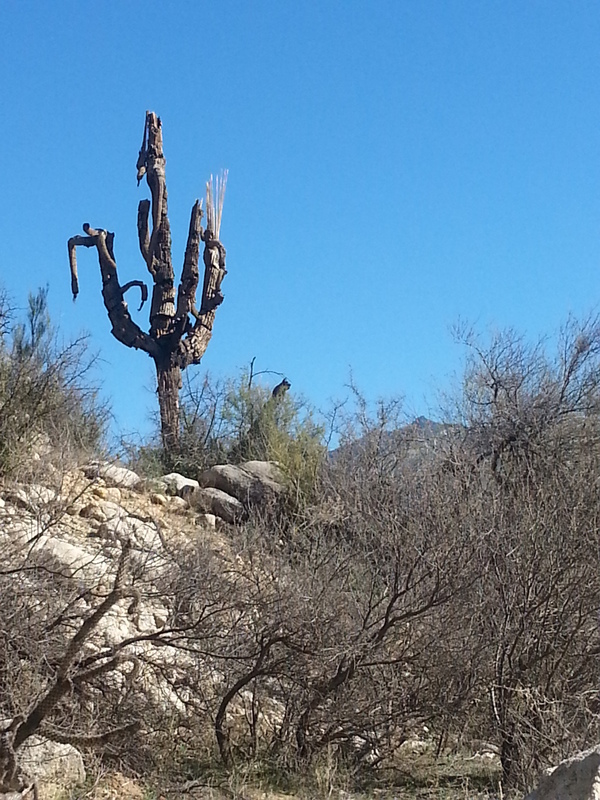 The Southwest is still like the end of the earth to me. So foreign, and un-Michigan.